Good times... I'm just sayin'. I was under the impression that GEEX wouldn't be happening again until 2012, but it's back and slated for October 2011. Team FNG has been a part of GEEX in both of its prior years. 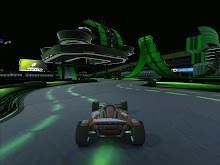 The first year we competed in a TrackMania Nations tournament, put on by Protocol 42; and DirtyDan and I came home with some swanky new GeForce 9800GX2's that provided us some SLI goodness. This year, GEEX is partnering with the Pushbutton Summit conference which will bring a host of panels and workshops for those in the digital media industry. With these already on-board, I'm excited to see what other game developers/publishers will sponsor and have booths at the expo. Maybe we'll enjoy the presence of Valve/Steam or Blizzard. Team FNG would like to wish Media One and the Pushbutton Summit the best of success with GEEX 2011. We look forward to tracking its progress and seeing what kind of event this will shape up to be.